When you think of Rome you inevitably think of its grand passed, of its ancient glory made up of Popes and Emperors, but that isn’t all there is to it. Not everybody realizes just how much the Eternal City is projected into the future despite its modern buildings testifying just that. This article covers the 5 contemporary architecture masterpieces you couldn’t possibly miss during your visit. Also known as the “Palazzo della Civiltà del Lavoro” or more simply “Colosseo Quadrato” the “Square Colosseum” it is one of the symbols of EUR, a somewhat futuristic district of Rome, and represents one of the icons of 20th Century architecture (Rational Architecture). Benito Mussolini wanted it built as an image of the real Colosseum. It was inaugurated during the Esposizione Universale di Roma – EUR (Universal Exhibition of Rome -) in 1940. As often happens in this city when the classical city planning is interfered with, the Palazzo was not at all well accepted by the locals and many years passed before becoming the “not to be missed’’ icon of today. It was, in fact, an attempt to merge the past with the future, but that aside, its minimalist style transmits modern charm and introduces the city to 20th-century architecture. Today it belongs to the well-known fashion house, Fendi. As the roman numbers suggest MAXXI is the acronym for “Art Museum of the 21st century” It was inaugurated in 2012 and designed by the late Zaha Hadid, the anglo-iranian architect of world renown. 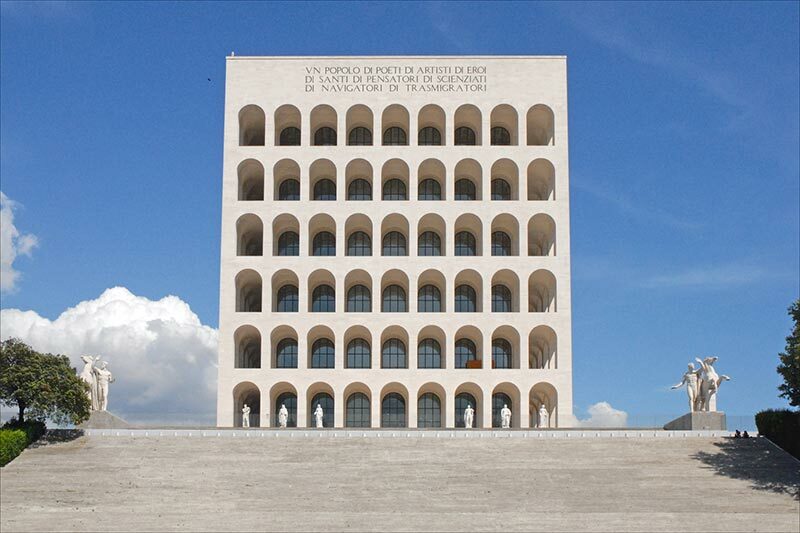 Situated in the Flaminio district and aside from hosting important exhibits by international Artists, its structure is a gem of contemporary architecture. 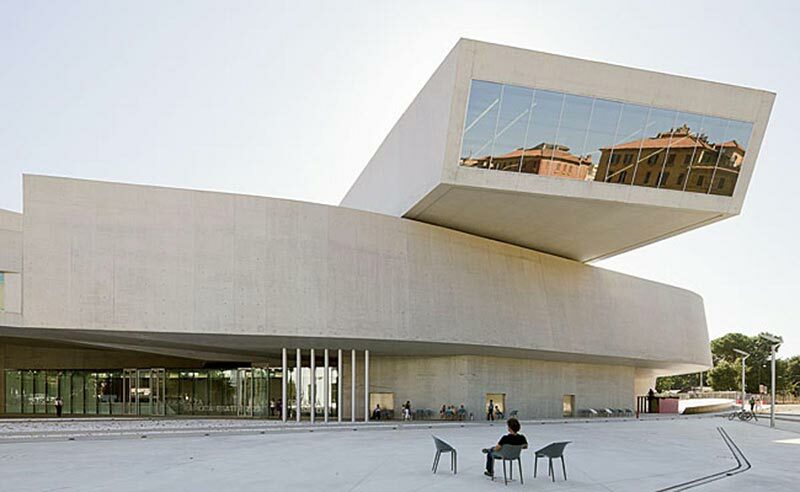 It is divided into two large areas which constitute the “soul” of the building: the MAXXI Art and the MAXXI Architecture which in turn represents the first national museum of Architecture in Italy. The winding and dynamic design, the great use of glass overlooking the city, call upon a new way of thinking exhibition space and constitute a real challenge for artists and curators projected into the future. Is located at the foot of the Parioli district adjacent to the Olympic Village. 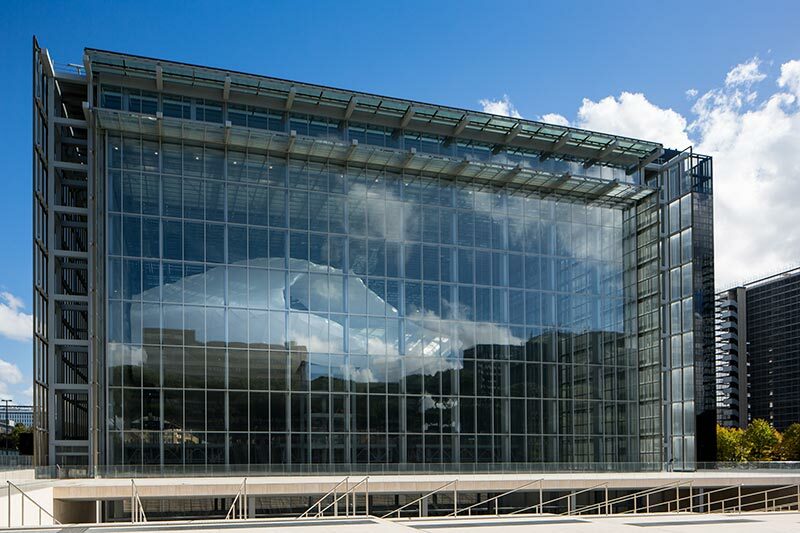 Designed by one of the most prominent architects in the world, Renzo Piano, it was inaugurated in 2002. The ultra-modern design merges beautifully with the tradition of the materials used to build it: travertine marble and Roman brickwork. If you happen to be in town check out the program which is always rich of internationally acclaimed artists. The unmistakeable shape of a ship and its wind filled sails makes it easy to make out from Rome’s best view points. 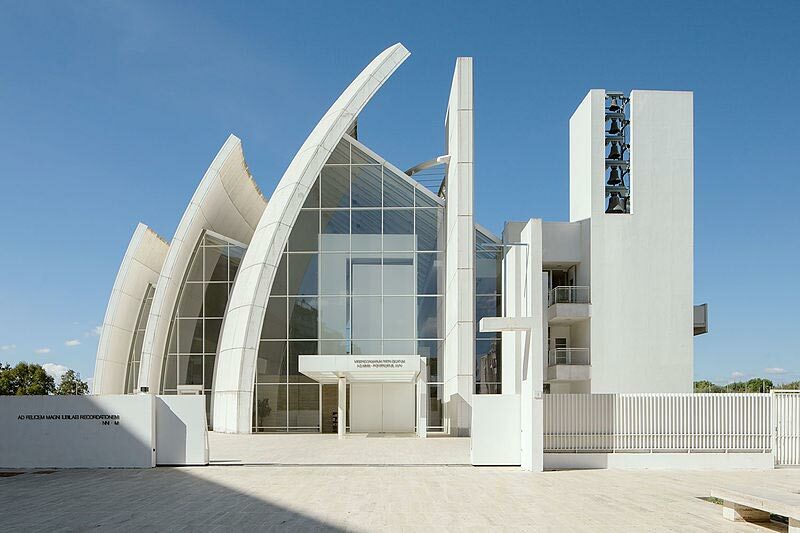 The church, located in the working class district of Tor Tre Teste, designed by Richard Meier was inaugurated in 2003. The building lends itself to a symbolic interpretation evoking the Paleo-Christian image of the soul which shiplike, points to the Lighthouse of Christ, and also symbolizes the Church that ferries the faithful to the third millennium during the historical Pontificate of John Paul II. Meier also designed the Ara Pacis Museum which encompasses the Altar of Augustus. Also known as the “Fuksas Cloud” from the name of the great architect who designed it, Massimiliano Fuksas, was inaugurated in 2016 and represents the latest work of contemporary architecture in Rome. 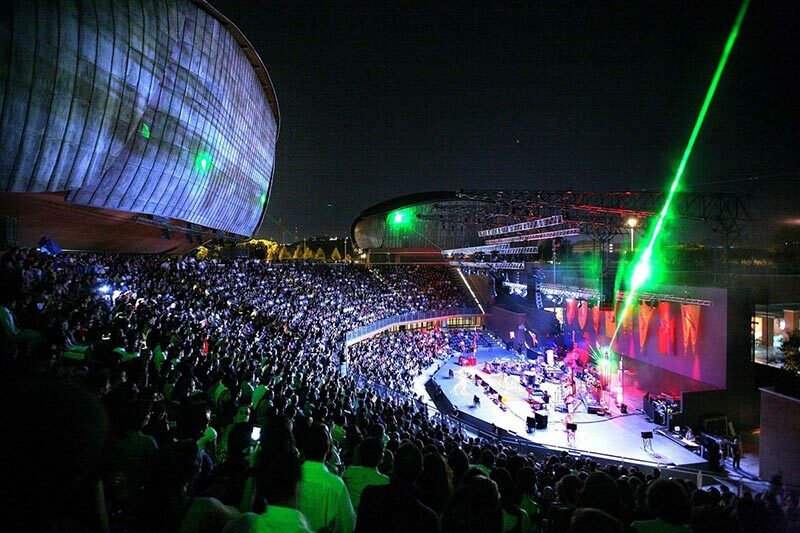 It is located in the EUR district of Rome and it will host events of various kinds from conferences and exhibitions to art galleries and shows. The structure is divided into three distinct parts: the Teca, a polygonal building made of glass steel and stone, the Nuvola (cloud) the heart of the creation encompassed inside the Teca, and the Lama a luxury hotel of some 441 rooms. The entire structure runs on by eco-sustainable energy and is built with technologically advanced materials. The building seems to challenge contemporary times, their instability and vulnerability aptly evoked by the imagery of the Cloud. In its own small way, Buzz4tours attempts to project Rome and its inhabitants into the future by using Buzz, an environment-friendly vehicle with avant-garde tech on board. All that remains for you to do is to jump aboard Buzz and visit these amazing sites. Here’s what we can do for you!